It’s amazing that we weren’t carried away by the swarms of mosquitoes last night…but it sure did make for an adventure. We had pages of books flying through the sky, trees crocheted with vibrant reds, blues and yellows, bikes zooming all around, and a lot of laughs as we all endured the itching and twitching from the bugs. 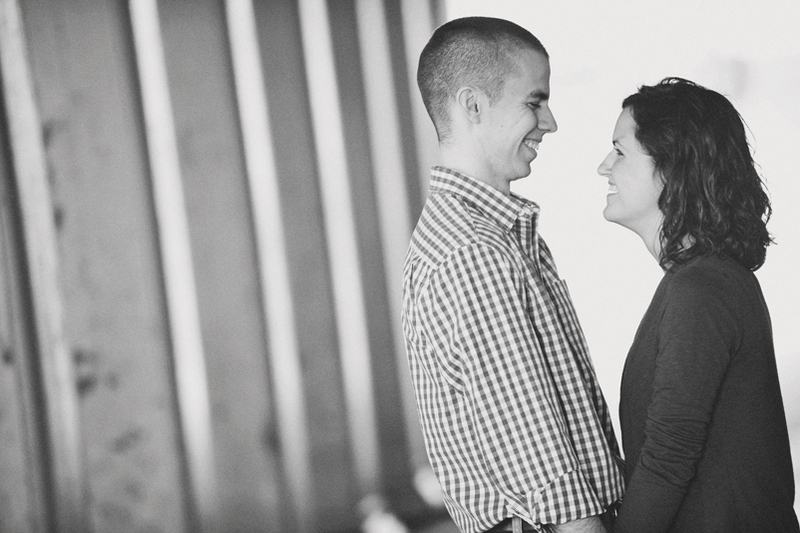 Enjoy a little taste of this engagement session with Whitney and RW. I’m looking forward to their wedding in October! Laura and Dan came out to Aurora for their engagement session a few weekends ago and we laughed…and laughed…and laughed… What a fun couple! I think you will see the joy that they have being together just from taking a look at their images. With a lot of family “themes” running through their wedding, they each brought a photo of their parents at just about the same moment in their weddings (walking back down the aisle as a newly married couple). 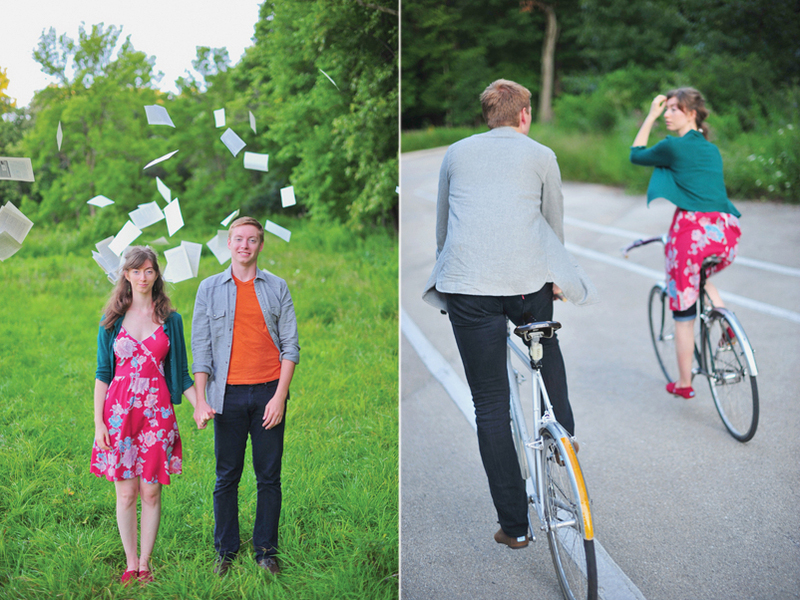 I thought this was a great thing to bring to the shoot, and love the images of these two showing off those photos. Shelby (Laura’s dog) also came along for the ride, and she was a perfect model. Enjoy! When we first met I remember thinking how fun it was going to be to photograph Katie and Scott’s engagement and wedding…they are just fun people to be around. We all met up on a Saturday evening in front of the Art Institute of Chicago and began our photo excursion. Even though there was still quite a chill in the air, these two were amazing in front of the camera. I cannot wait until their wedding in July… Thanks Katie and Scott for allowing me to document this part of your love story! I love these! Keep it up neighboring photographer friend! You have a really out of the box fun style! I was wondering if you would share the location of the white wooden… I guess the best way I could describe it is an “artistic gazebo”? I would love to check it out. Brittany, this is the south pond pavilion at Lincoln Park Zoo! Have fun checking it out! This post makes me so ready for Spring here in Chicago! Ayme and Court were so much fun to work with, and the New Orleans weather was fantastic. We did a lot of laughing and walking in the City Park, and then headed to the French Quarter before they headed back home. I am looking forward to their wedding in May! Enjoy these shots from their session… Thanks Ayme and Court for such a fun time in the Big Easy. super solid work man! Great images! I’ve always wanted to check out new orleans… you lucky duck! These are beautiful, Robert!!! They looked very at ease with being in front of the camera. Very photogenic couple! I love the one of him holding her with her eyes closed. Such beauty in love!!! Awesome post! Super cute couple! Love their outfit changes too! Love her Updo, the shots are so crisp. Love it.